The first three rounds were a real struggle, and rounds 4 through 6 weren’t too big of a change. I did manage to avoid losing, though, so that was something. In round 4, I got my third black against IM Levon Altounian. This was my 6th time playing him since 1998, and my fifth time with black. The previous four times featured a Petroff (a draw), a French (a win for me), a Reti (another draw), and a Slav (in a rapid mini-match, a win for me). The opening was a King’s Indian Attack (KIA), and I went with the Lasker System where Black puts his pawns on e6, d5, and c6, while the light-squared bishop gets out to f5. I’ve switched back-and-forth from that setup to the Capablanca System where the pawns go to the same squares, but the bishop goes to the g4-square. Black doesn’t have any real targets (the e2-pawn is the closest thing at the moment), while his queen is a little funny on b8, and his light-squared bishop doesn’t have any good squares or prospects. Still, it’s not like White is doing all that much, and so long as Black is careful not to walk into an e2-e4 push or let his light-squared bishop get trapped, he shouldn’t have any serious troubles. White has just played 13.Rac1, which keeps him from getting into trouble with his bishop on d4, knight on c3, and queen on b3. 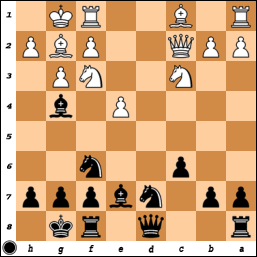 If it were Black’s turn and the rook were on a1, then Black could play 13…Ng4! here. Black threatens 14…c5 and 15…d4, hitting the queen and forking the minor pieces. Thus, White has to play 14.h3. 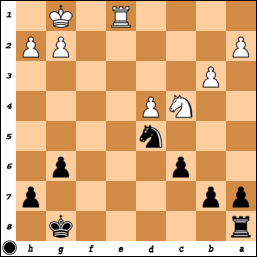 Now 14…c5 15.hxg4 cxd4 16.Nb5 isn’t really what Black wants, but he has 14…Nxf2! instead. If White plays 15.Bxf2, then 15…d4 recovers the piece, and then White will end up down a pawn – he will have to choose between capturing the pawn on c3 and saving his pawn on g3. Meanwhile, 15.Rxf2 loses to 15…Bxg3, when both pieces are en prise and Black still has the latent threat of …d5-d4 later on. 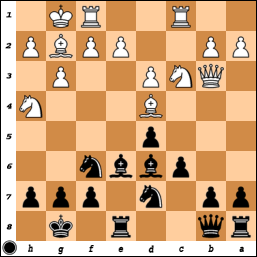 Moving the rook to c1 guards against this, as after 13…Ng4, White has 14.Na4, covering the c5-square. Without …c5, the knight on g4 is just silly. Thus, in the above position, I played 13…b6, taking full control of the c5-square. White noticed the idea and brought his queen back to c2, and then I proceeded to finally develop my queenside with 14…Qb7 and 15…Rad8. The position was about equal then for a little while, but in playing for a draw, Altounian started to slowly drift into a worse position. In a sterile position, you can just shift around aimlessly, but in an equal position where both sides have potential improvements to make, the draw isn’t inevitable, and so you have to do more than shuffle wood around. I’ll start with the finish, and then work my way there from the beginning. I ended up with 3.5/9, tied for 18th place with GM Melik Khachiyan, GM Alex Lenderman, and IM Levon Altounian. The minus-2 result was a big disappointment, as I had been generally playing well leading up to the event, and I had higher hopes for my first US Championship. The title was taken in tiebreaks this year by GM Gata Kamsky over GM Yury Shulman. Both finished the set of regular games with 7.0/10 (5.0/7 in the main event, and then 2.0/3 in the quad), and by holding a draw with black in the sudden-death tiebreak game, Kamsky won the title. I knew I would be playing Shulman in the first round (in a closed field, it’s not difficult to figure out where the cut is made), but the colors were up in the air. When Nakamura drew the black envelope at the opening ceremony, it was clear Yury would have the white pieces against me. Not ideal, but so it goes. 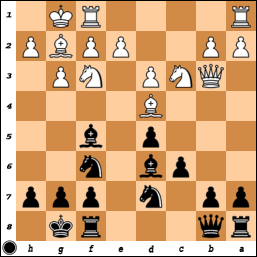 Shulman and I share a lot of the same openings – as white we both play 1.d4, while as black, we both play the French and Semi-Slav Defenses. Thus, I was a bit wary of walking into some home-cooking and surprised him right away in the opening with the Queen’s Gambit Declined. White has just played 24.h3, creating some luft for his king. However, there is a second idea behind the idea, which explains why Yury chose that pawn move instead of 24.g3. After h3, White threatens to sideline Black’s bishop with 25.g4 and then 26.Ne5. Black’s bishop could come out to e4 then (or f7 if he plays 24…f6), but the real problem then is that while White’s knight can be used to target the queenside, Black’s bishop has no real active prospects. Thus, while 24…Bxf3! 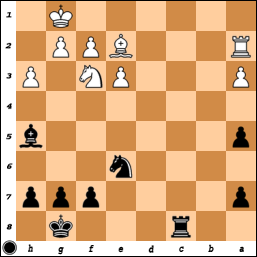 might look a bit unnatural (giving up the bishop for a knight in an open position), it is definitely the right move. 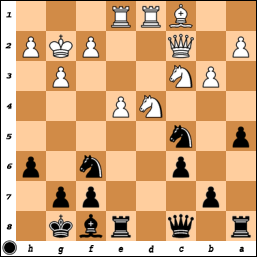 After exchanging off the bishop, I activated my rook and knight, fixing the weakness on a3 in the process. Eventually, to save his a3-pawn, Yury had to give up his bishop for my knight and then an exchange of a3 for a7 ensued. It’s a rook and pawn endgame with equal material and no obvious weaknesses. 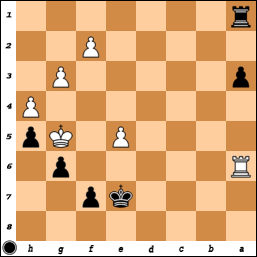 Furthermore, Black has an outside passed pawn. So what kind of trouble could he ever be in?